I won't list everything here, but I nearly had to enlist the assistance of the store staff, to help me carry it all out to my car. 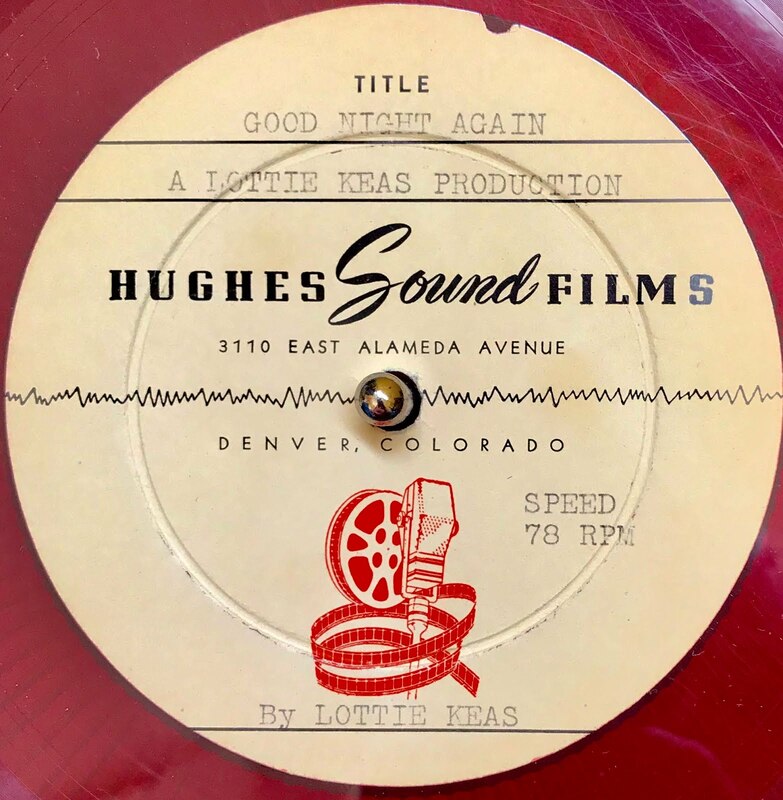 Among the haul, was this red vinyl, 10" 78rpm test pressing, on the Denver-based Hughes Sound Films label (photo above). 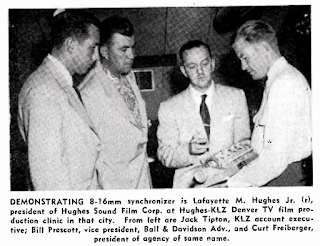 Hughes Sound Films was not the the brainchild of Howard Hughes, but instead Lafayette M. Hughes, Jr., a Denver film and sound producer, and the grandson of former US Senator Charles Hughes. A 1952 issue of Broadcasting indicates that he held weekly sound production seminars, at KLZ-TV, in the early age of Denver television. The station first signed on the air, Nov. 1, 1952. Lafayette Hughes, Jr. passed away in 1965. 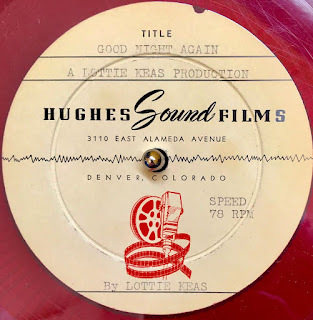 (NOTE: The address for the Hughes Sound Films is 3110 E. Alameda, which may have been his Cherry Creek home. The original structure was torn down, to make way for condos, which is what shows up, in a Google map search). On this particular one-sided record, I noted the name Lottie Keas. I had seen that name before, but couldn't place it. 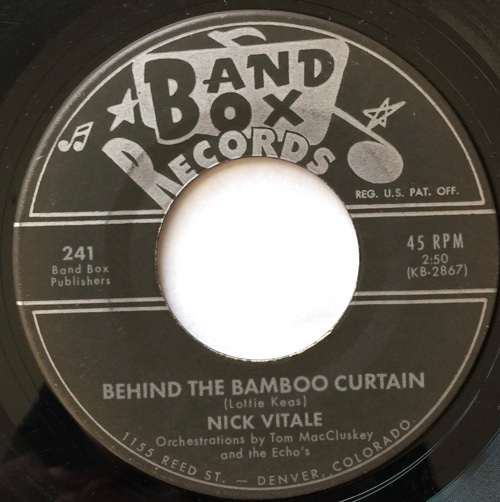 Then, by chance, I was going through my Band Box 45 collection, and spotted the name, on the Nick Vitale single, "Behind the Bamboo Curtain" / "Engagement Waltz." Keas was listed as the songwriter, on both. While the Hughes record Mike gave me lists Lottie Keas (twice), I assumed she was the vocalist on this record, but was surprised to find an unidentified male vocalist singing "Good Night Again." Listen to a sample of "Good Night Again"
Is that cool Denver find, or what? Has a very 1920s vibe to it. Sounds like it would have been perfect, as a featured number in the Ziegfeld Follies. An aside, I found that Lottie Mae Keas was born in 1901 and died in 1982. A quick copyright database search finds that she wrote a handful of songs, including "Could The Lady Be Blue" (1938 with Maybelle Taylor), "During Intermission" (1947 with Maybelle Taylor), "Lover's Lane is in the Heart" (1950), "Let Us Waltz" (1956 with Lee Palmer), "Playmate" (1956), and "Behind the Bamboo Curtain" and "Stranger to Love" (1960). Interestingly, I couldn't find a reference to "Good Night Again."